Serge Lutens has launched a new website designed for US shoppers. At us.sergelutens.com you can find information on Serge Lutens, his work, creative vision, and of course, his perfumes. The entire collection is available for purchase via internet, bell jars included. 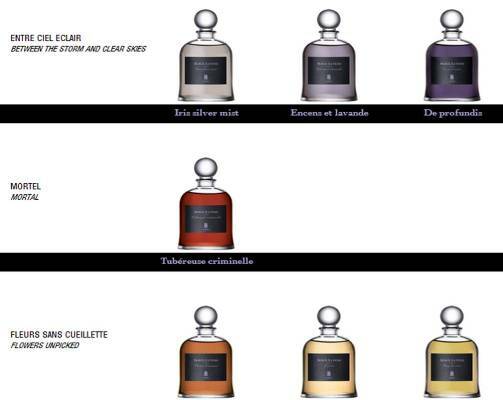 The collection is organized into several groups, such as Fouets de Velours (Sudden Sweetness) that includes perfumes like Ambre Sultan, Chergui, and Boxeuses, or Fleurs San Cueillette (Flowers Unpicked)–Un Lys, Rose de Nuit and Fleurs d’Oranger. The latest launch, Une Voix Noire is described as “jazz, drinks and the night, and, beyond all that, a troubling line of white, gardenia-scented smoke.” The only thing to keep in mind is that the prices on the bell jars are much higher than what you would pay in Paris. Bela: The new website is so lovely. All those cute little bottles! The markup is huge, but imported goods are always more expensive than non imported ones. I don’t think it’s going to stop people from buying those fragrances. Myself, I already couldn’t afford them two years ago. Victoria: I’ve noticed that the translations were, let’s say, loose. La Peau du Bois, for instance. Although, wood skin doesn’t sound nearly as poetic in English as it does in French. Bela: (Not Victoria, but an old Lutens fan too.) I would say that, in general, the Exclusives have always been more ‘challenging’ than the Exports (why are they calling them Selective Distribution Fragrances? Everyone’s always called them Exports). Which, makes sense, if you think about it: fragrances that were meant to be released worldwide had to be more instantly likeable than those that had a more restricted distribution. Of course, once some of the Exclusives started being sold as Exports (which happened several years after the fragrances’ original release) the distinction became more blurred. I think there is a real difference between Iris Silver Mist and Clair de Musc, for instance. Victoria: Ah, that’s such a good point about the price. It’s true, if one has a chance to buy the perfumes in Paris something like Ambre Sultan in a bell jar is a better deal than the export square bottle. irem: Thank you very much for your reply! Alas, in the US at the current prices, the bells jars are much worse in the price-per-ml department: $140/50ml for tall bottles vs $300/75ml for bell jars. That means $90 for the Bell Jar alone!